A great article by Dubspot Instructor and Native Instrument product specialist Mike Henderson aka DJ Endo. This article dispels a common myth about PC’s and Windows. Today more and more DJs are using laptops as their main platforms for DJing, and use Digital Vinyl Systems (DVS) like Traktor Scratch Pro to control the music on their computers using Timecode vinyl, Timecode CDs and MIDI controllers. One of the main decisions for DJs entering the digital realm is what computer to get. While Macs are “plug and play”, and are great machines “right out of the box”, they can also be very expensive. PC’s can be significantly cheaper, and can work just as well as Macs if not better. There are many different brands of PC’s out there with varying price ranges. Someone that doesn’t have over $2,000 to blow on the new souped up MacBook Pro can get a PC that’s just as powerful for half the price. So why don’t they? A common myth about PC’s and Windows is that DJ and production programs don’t run well on Windows. One reason people might think this is because they don’t know how to optimize their PC computer correctly for Audio. Another problem is that there are so many different brands of PC’s on the market, and so many combination of hardware and software that you can use that it can lead to compatibility issues and problems with the hardware interacting with each other. One last issue is that a lot of PC computers were designed and optimized to use with word processors and games, and aren’t tuned up right for DJing, Production and long term audio processing. One of the main reasons for this is because most PC users buy their PC’s for gaming and word processing. It is because of this, that you must tune up your PC computer to perform well with real time audio. In this article I will go over the most important tuning tips for tuning your PC for digital DJing and Audio. This tutorial is more geared towards Windows 7 users, but the same rules apply on all Windows systems. I would recommend bookmarking or printing out this article so you can refer back to it at any point if you ever have problems with Audio dropouts, artifacts or performance issues. 1) Update your BIOS (Basic Input Output System). BIOS Stands for “Basic Input Output System” which is a mini operating system that runs on a chip on your mainboard. It controls how the mainboard’s components interact with each other (on a hardware management level before windows gets into the mix). The BIOS update will improve the performance of your mainboard components by fixing bugs. Updating your BIOS can improve your computers performance dramatically. To update your BIOS, visit your computer manufacturer’s, and download and install the latest BIOS update for your exact model number. 2) Install the latest chipset drivers for your computer by visiting the manufacturer’s website and downloading the latest chipset drivers for your exact computer model. A “Chipset” refers to a group of important processor chips on your computer’s mainboard, which handles things like hard drive and USB operation. Your computer comes with a generic chipset, but this was made as a “one size fits all” solution for being compatible with as many models as possible. Installing the manufacturer’s chipset drivers will usually give you much better performance. 3) Download and install any other drivers for any hardware components installed on your computer including Audio Drivers for Built in or external audio interfaces or controllers, and any other driver that the manufacturers recommend you download (network adapters, built in audio interfaces, FireWire controllers, graphics drivers etc.). 4) Disconnect everything from your computer except for your Audio Interface. See if you have audio dropouts with ONLY the Traktor Audio 10 connected. Now plug in other USB devices one-by-one and see if you get Audio dropouts. If so, the device may be taking up too much USB power, and the drivers might have to be updated for that device. You might also try plugging in the device to another USB port on your computer because a different port might work better. If you’re plugging in bus-powered devices into a USB Hub, it might be hogging all of the power from the port, therefore causing problems and Audio dropouts. Also be sure your Internet is off. Wi-Fi is the number one cause of audio dropouts! 5) Always use ASIO Drivers. When you are choosing your soundcard in whatever DJ program you are using, make sure it says “ASIO” next to it. 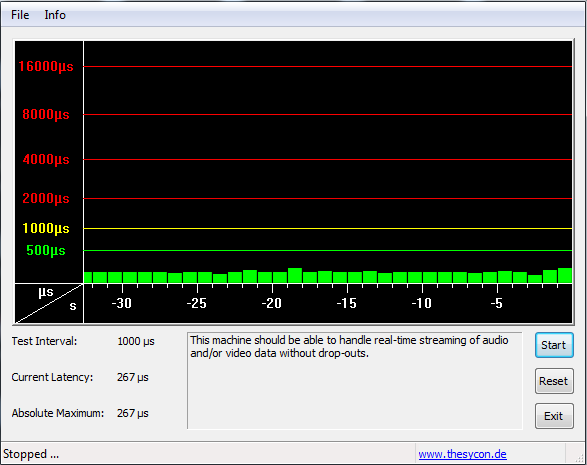 If you don’t have the option for ASIO, you can download ASIO4ALL at ASIO4ALL.com, which works for most soundcards. Once ASIO is installed, make sure you choose the ASIO driver, and NOT the direct sound or WASAPI driver when you are DJing. It’s important to note that a lot of Audio Interfaces that are designed for music recording and production come with their own ASIO drivers that are designed specifically for that device and have much better performance than the generic ASIO drivers. 6) Find what Latency Setting works best for you. Latency is the delay that happens between when you perform an action (such as pushing a button, or scratching a timecode vinyl record) and when you hear a result (ex. The time it takes for an effect to turn on after I push a button on my Traktor Kontrol X1 Mk2). Depending on how powerful your computer is, you can have close to no latency like 2-5 milliseconds (which the human can’t even perceive) vs. 50-80 ms (which you will notice a slightly significant delay and may be distracting). It is generally true that the lower the latency is set to, the more the computer is strained and has to work. So you will need to find a good buffer size that works for your computer. In Traktor, there is a latency bar in preferences – Audio Setup where you can raise or lower the buffer size. I would try it at 512 ms, then try at other multiples of 128 such as 256, 128. If you do not see the Buffer Size box, you might be running an older version. In that case just raise and lower the latency bar until everything is running without any audio dropouts. When your computer has reached the correct latency setting, your CPU meter will be lower and the Audio will not have any dropouts. 7) Figure Out What is causing the problem. Sometimes it is hard to figure out what is causing problems with your PC’s performance. Here are a couple free applications you can download that will help you figure out the cause of your problems. DPC Latency Checker will give you a graphical chart that will show you how much CPU your computer is using. Just install the application and run it for two minutes while your DJ program is running and you will see a chart that shows you if your computer can handle the programs your running or not. If the bars are Green, that is good. If the bars are yellow or red, that means some applications or processes might be straining your computer and causing audio dropouts or distortion. 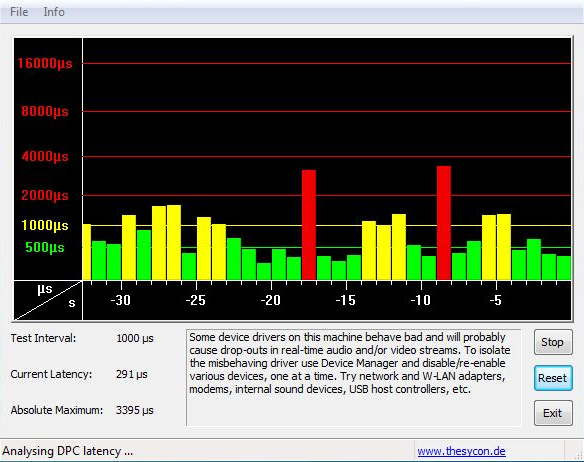 7-2) If your DPC Latency Monitor is showing yellow or Red spikes, you will want to download LatencyMon here. After you’ve launched LatencyMon, click on the play button to begin analyzing the processes that are running on your computer. Now click on the “Drivers” Tab to see the results of the Driver Monitoring. Then click twice on the Highest Execution (ms) tab to sort by what’s causing the highest values. You might have to expand the window to see Highest Execution Column. In this screen shot, you can see that everything is lower than 1, which means they are not problematic. However, multiple drivers that are lower than 1 (.8, .4) may equal more than one (.8+.4 = 1.2) which can be problematic. 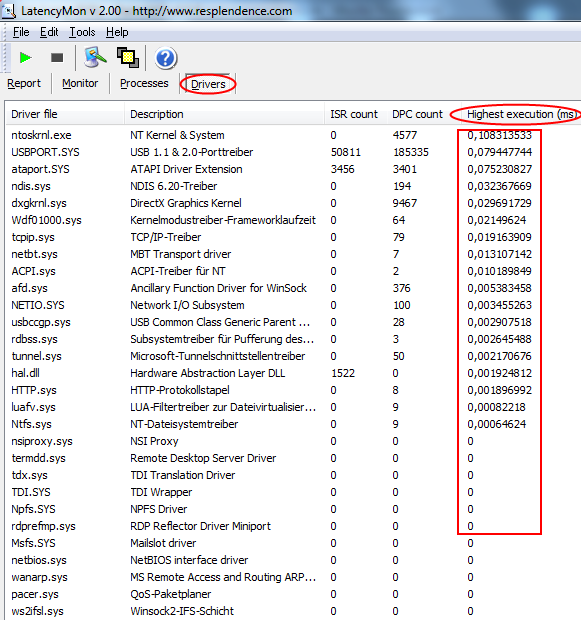 So you will want to disable as many of these drivers as you can in the windows device manager. If you don’t know how to disable a device, search the web to find out what the device is, and how to disable it. Right click on the “Computer” icon on your desktop, and then select Properties – Device Manager. In the device manager, find the device that LatencyMon reported as problematic. As long as the device isn’t in the list above (necessary devices for windows to run) you can disable it by right clicking and choosing “deactivate” (NOT UNINSTALL!). Network Adapters: Disable all of these to turn off your WiFi. Always make sure your WiFi is off when you’re DJing. You can additionally do this by clicking on the arrow on your dock to show all open applications, and right clicking on your WIFI application and turning it off. Turn off Windows Update in Control Panel – System and Security – Windows Update. Network Adapter, WLAN card, Bluetooth port, Infared Port, ACPI complaint battery, Trackpad (only if a mouse is connected), Video Camera, DVD Drive, Any third party component that is not an essential part of the system (be careful). 09) A lot of computers come with an application that will take over the control of the energy settings of the computer. 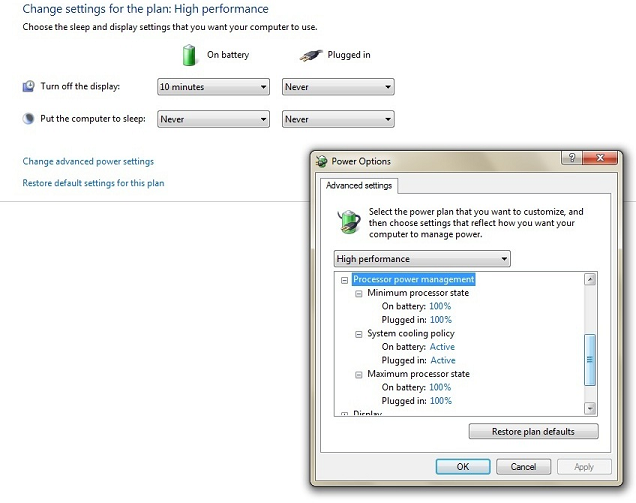 This will override your energy settings in the Windows Energy options. If you have an application like this, deactivate it. In the device manager (Start – Control Panel – System and Security – System – Device Manager), in the Universal Serial Bus Controllers section, right click each “USB Root Hub”, choose “Properties” – “Power Management” and uncheck the “allow the computer to turn off this device to save power” option. 11) Install Microsoft Hotfix for USB Spikes – There is a known issue with CPU Spikes causing Audio dropouts on Windows 7 and Windows Vista. You can download the hotfix for this here. 12) Disable Aero – Aero is the Graphical User Interface (GUI) used by Windows 7 by default. This can cause audio dropouts. You can disable this by right clicking on the desktop and choosing “Personalize.” You can then scroll down and select a color scheme from the “Basic and High Contrast Themes” section, such as windows classic. 13) Graphic Card Tools – Some Graphic Card Tools like ATI Power Play and Nvidia Powermizer interface with real-time audio, since they prioritize the graphic card performance over other processes in the system. Try to disable or uninstall these tools by going to Control Panel – Programs – Programs and Features. Right click the “Computer” icon on your desktop. Then select Properties – Advanced System Settings. On the “Advanced” tab under “Performance” click the “Settings” button. 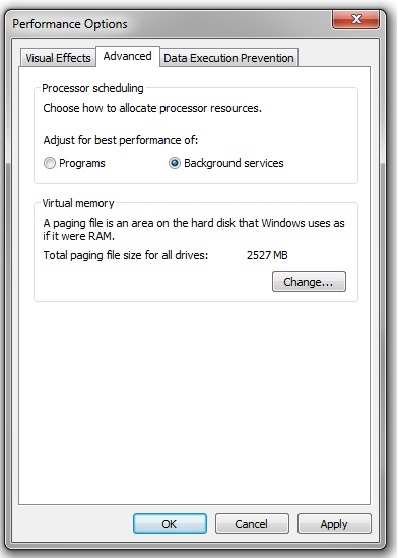 Again, on the ”Advanced” tab under “Performance Options” select “background services”. Ableton Push 2 and Live 9.5 Now available in India!